Thread is a new website aimed to help take the inconvenience out of finding the right clothe for you. After all, with jobs to do, reviews to write, gadgets to test and games to play who really has the time to browse through the thousands of items of clothing available, let alone figure out which items go well with each other? The idea is simple, you sign up, indicate what style you like and then one of their stylists sends you suggested outfits each week. You provide feedback and, in theory, the stylist learns what you like and dislike and get’s better at picking items you want to purchase. The service is free to use and there is no obligation to buy from them, so what’s such a service like to use? We signed up as a new customer to find out. The signup process is quick and simple. You can either log in with Facebook, or if you’d rather not allow such access you can sign up via an email. You’ve the option of uploading photos to give the stylist an idea of how you dress at the moment/what you look like generally and you complete a short questionnaire about the clothes you like, the looks you’re interested in and what you’re looking to get out of the website. Overall this process was quick and easy, although the photo uploader could do with some work, be great if you could upload more than one photo at a time. After you’ve completed the signup process you’re matched with a stylist. 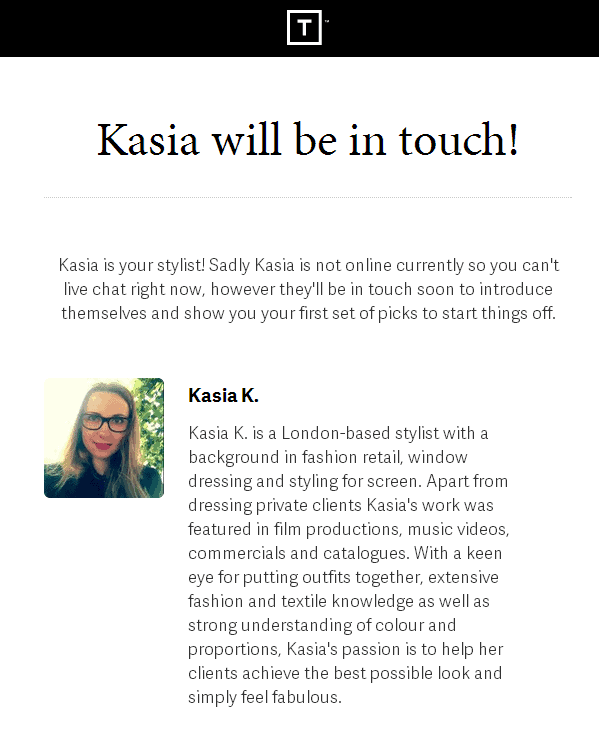 At the time of signup my new stylist was not online, but if they are you may get the option to have a quick online chat to introduce yourself and get to know each other a little, a key ingredient of the site. Email from Thread, annoyingly the emails keep ending up in the spam filter, hope marking as not spam will eventually sort this out. Revisiting the website there are now 5 suggested outfits to review, each based on a style and the preferences set during the signup procedure. Each outfit is broken down into it’s component parts, for example T-shirt, shoes, trousers etc, and you can rate each item according to if if you like or dislike like it. If clicking dislike you can further select why (e.g. too expensive), but curiously this isn’t available if you like something. For example you might like a pair of shoes, but want them in a different colour. The only option is to dislike them and say they’re the wrong colour, which felt too negative when you might buy the item if it there was a different version. Each suggested item is available to buy via Thread, and they list the source of each item (e.g. ASOS.com). A quick check confirmed the prices are the same as the source website, making this a handy way to shop across a number of sites at the same time. Making use of a special offer giving me £5 off my first shop an order is placed for a couple of items. Email to say there has been a delay due to problems obtaining stock from their suppliers. Credited £5 off my next shop to make up for the inconvenience. The order is well packaged and comes with everything you need to return items you don’t want. Returns can be handled via Royal Mail or via the Collect+ service. On this order the returns process was tested as the wrong sized jeans had been ordered. Having entered my preferred sizes during sign up there was an incorrect assumption that the site would automatically select my preferred size when placing an order. The unwanted items were easily sent back via the Collect+ service. I received confirmation that the returned items have been received and refunded fairly quickly, far quicker than an ASOS order I sent back via the same method on the same day. My initial experience has been a positive one and seems like a good site to keep an eye on. Interestingly there isn’t really any follow up from the stylist on the items ordered, for example I’d have at least expected them to ask for a photo to see if they’re suggestions work for me. As the site collects feedback data regarding clothing it’s also possible it’s sharing/selling that information with it’s suppliers, but I’ve not had this confirmed or denied. Yes, it’s well worth a look. If you don’t want to trawl through lots of online catalogues this website offers you a genuinely useful way to find clothing that might be of interest to you, and it allows you to explore a new look or style. Interaction with the stylist has proved very positive and the suggested items have thrown up some items I wouldn’t normally consider. I would be good to see some email frequency controls in case you want to take a break from receiving suggestions. I’ve been testing Thread for a few weeks now and it’s a good site. Of course as they make money via your purchases it does mean you’ll get emailed lots of suggestions to try and tempt you, but this isn’t really any different to any number of online shopping sites. It’s good to see you can view all liked items at a later date, they’re not lost if you don’t happen to order them the week they’re suggested. While it’s convenient to shop directly on the website consider that this could add a delay and you will certainly not benefit from services such as the ASOS VIP scheme that gives you next day delivery on all orders for just £10 a year. Shopping direct also means you’ll miss out on cashback from sites such as Quidco or TopCashback. However, as there is nothing stopping you from ordering directly from the supplier there really isn’t a downside to using the service and by ordering everything from a single website you don’t need to worry about dealing with multiple deliveries/delivery charges. At the moment the site is also offering a £5 referral credit to help drum up some users, so if you like it you can spread the love to friends and family and get some money towards you next shop. Hopefully the website will continue to be developed to iron out issues such as not making use of your preferred sizes, and perhaps a little more interaction after orders have been received to give feedback on if suggested items actually work for you. 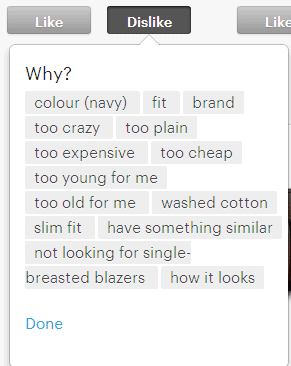 In the current form the site is interesting and offers a convenient way to shop for clothing, but I’m not really convinced about the personal stylist side of things, it doesn’t feel any more personal than Amazon’s suggested products system and there isn’t really any interaction unless you send a message to the stylist.